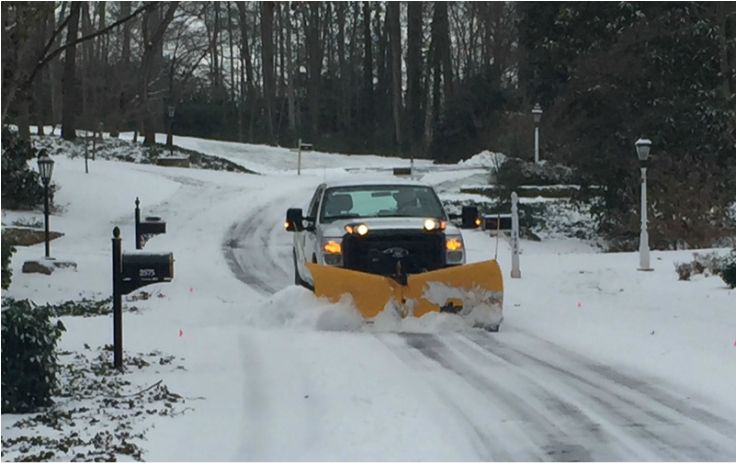 Yesterday marked the first winter storm of the season, and Marsh Brothers was out clearing the way for Winston-Salem residents. We had a lot of fun testing out our new snow plow, and are out again today shoveling additional driveways and plowing streets. Contact us today if you would also like your driveway or walkway cleared! Marsh Brothers helped keep Winston-Salem beautiful last Saturday by leading the Community Roots Day, a volunteer event for citizens to beautify their local area! Community members from across Winston helped plant over 500 trees along Clemmonsville Road near I-52, creating a greener, more attractive landscape to this active street. 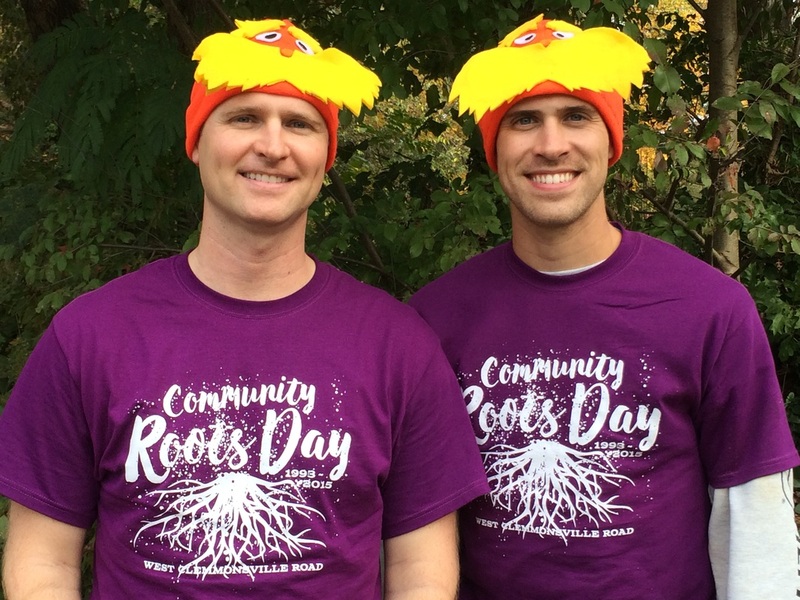 A huge thanks to all of the volunteers for making this event possible, and to Dr. Seuss for our awesome Lorax hats! 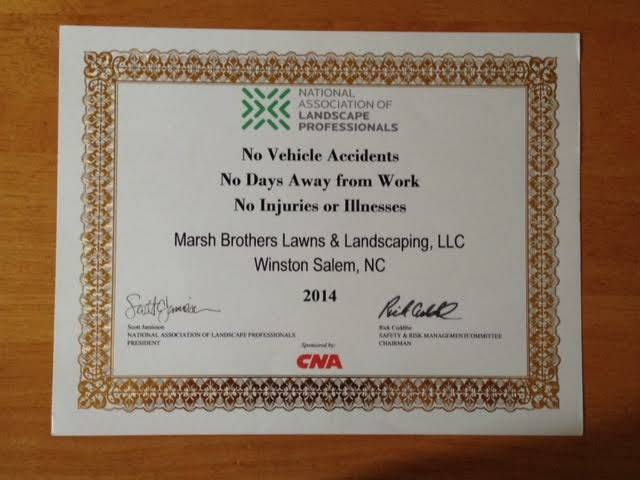 National Association of Landscape Professionals - Safety Recognition Award! What an exciting day over at Marsh Brothers! We just received a letter in the mail from the National Association of Landscape Professionals congratulating us on a great (and very safe) 2014. NALP awarded us with a safety award for our company having no vehicle accidents, no injuries or illnesses, and no days away from work. Feel confident that not only are Marsh Brothers a hard-working and competitively priced company, but we are one of the safest as well! Fall Aeration - Living Social! Aerating your lawn every fall helps provide oxygen to your soil and promotes better seeding and fertilization. 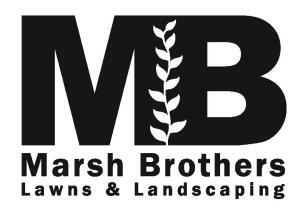 This year, Marsh Brothers is offering a deal on LivingSocial.com - up to 6,000 square feet of lawn aeration for only $78 (a $195 value)! Keep your grass looking great by treating your yard to an aeration! Please feel free to call or email for additional details! A great lawn starts with great soil! A best practice is to have your soil tested about every 3-5 years, and the Forsyth County Extension office actually offers free soil testing for individual homeowners. The test will tell you what nutrients you need to add to improve your soil, and to customize micro-zones for individual plants. Never over-apply or use a product that is not needed (We most often see this with lime!). Or, if you prefer, let us do the work for you. Typical results take about 3 - 4 weeks, so make sure you give yourself plenty of time! 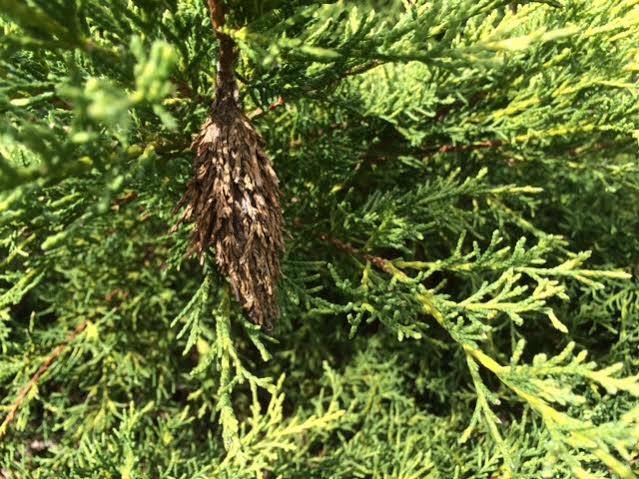 Bagworms infest many trees and shrubs in the Triad area. Bagworms are bad worms. They are often unseen, hidden under leaves and branches, and can kill a plant very quickly. They wrap a protective silk shell around themselves and slowly eat away at your plant. You may notice that your tree or shrub has bagworms as soon as it starts to turn brown. If you believe you have bagworms, don't wait to get treated! Call Marsh Brothers today so we can send out a crew member as soon as possible to save your plants from these awful pests! For more information on bag worms, feel free to read this article. Rain, Rain, Come and Stay! Yes, the grass is growing again, finally! In the first ten days of July we’ve received 1.37 inches of rain compared to 1.81 inches during all of June (Data from the Weather Collector). 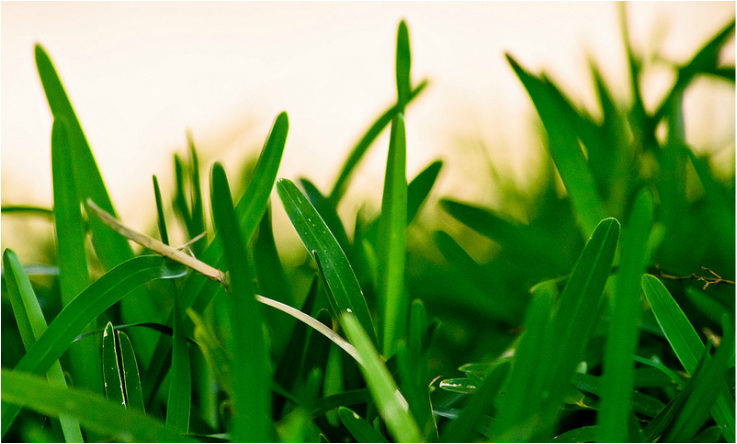 Keep your lawn healthiest by cutting off no more than a third of the blade at any given time. Keep your mowing height at or above 3.5 – 4 inches, and it will help both discourage weeds and weather some of the more intense summer heat. 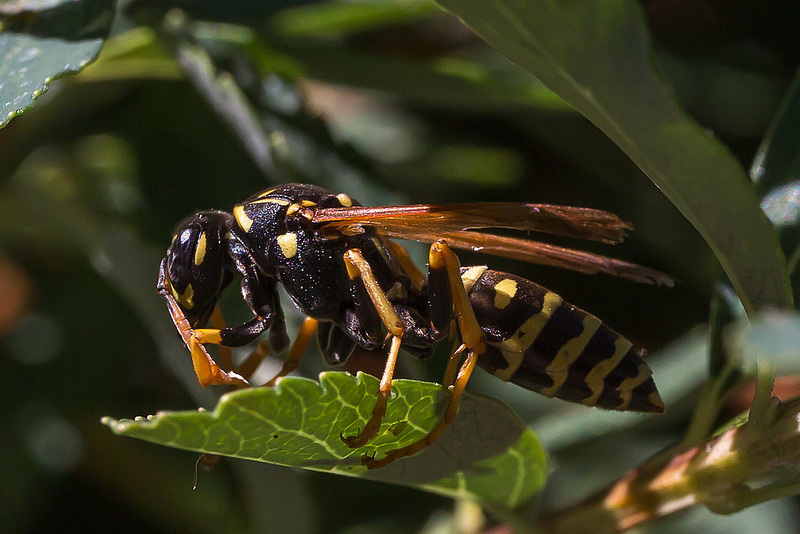 Don't let Yellow Jackets, Wasps or Hornets spoil your outdoor activities this summer. This time of year the underground nests can be a major problem! Check out this link for details on locating and marking any nests for elimination!